If you’re a regular follower of this website-you would also by now know that I try to add my own healthy twist to dishes, so that my family and clients can get the best of both worlds! 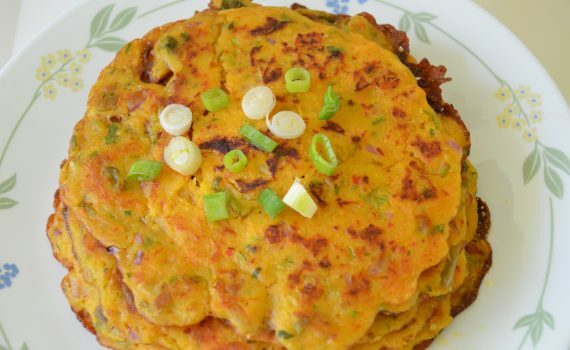 So here is the favourite Korean dish called Kimchi pancake with an Indian and healthy twist. The original recipe calls for ‘all purpose flour/maida’, kimchi, onions, salt and sugar. To make it healthier-I substituted the maida with rava(semolina/farina) , rice flour(to make it crisp) and a little besan(to bind it). For those who are not familiar with Korean cuisine, kimchi is a staple and a must have accompaniment of meals. It’s basically a fermented dish with different vegetables and spices. The most popular is the made with napa cabbage. Buying kimchi would probably be frowned upon in Korean families. They make their own kimchi and each family is supposed to have their own recipe handed down from generation to generation. Some families have an entire fridge stocked with just different varieties of kimchi and nothing else-that should give you some inkling as to the importance of kimchi in Korean cuisine. Kimchi is not just eaten as a side with meals, but there are various dishes made with it like Kimchi Fried Rice, Kimchi stew, Kimchi dumplings, Kimchi wraps and so on. 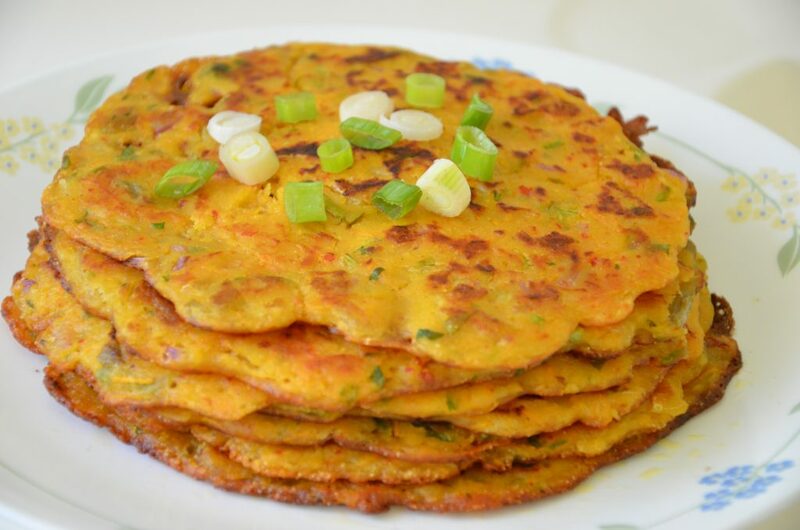 Mix all the ingredients together (the optional items are not added in traditional kimchi pancakes, so it’s upto you) with some water to get a thick consistency batter. It shouldn’t be a flowing consistency. Check for salt. Heat an cast iron tava/dosa tava on medium high heat. Add some oil and spread it with a cut onion( a trick my grandmom used to do to make the tava non-stick). When it is hot(sprinkle some water on the pan, and it should sizzle), take a ladleful of of the batter and spread evenly onto the tava. Cover and cook for a few minutes, add some oil to around the edges. When you see the edges browning, flip over and let it cook on the other side on medium heat for another minute. Flip over once more and let it cook for another 30 seconds. Serve hot as is. You don’t need any chutney with this as the uttapam itself is very flavourful-tangy(from the kimchi) and spicy. You can end the meal with some yummy Korean Cinnamon Tea. to increase the fermented benefits by using fermented dosa batter.